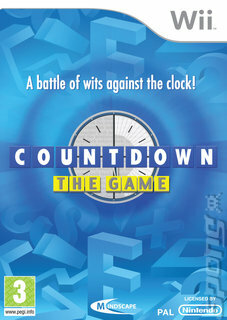 Countdown, that long-standing bastion of afternoon television, is now on your Nintendo DS. The first programme aired on Channel 4 waaay back in 1982, with 59 series broadcast and over 4,000 episodes clocked up since its debut! Become a contestant in this supremely popular TV game show and face an opponent or take on a friend in a battle of wits, competing not only against them but also against the clock in challenges of lexical dexterity and numerical agility! The game includes five levels of difficulty from beginner to brainiac, so novices at beating that famous clock need not worry about being outfaced. With Countdown DS closely following the TV show's easy to play format, this game is sure to have you addicted, just as millions of viewers have been since the TV show first appeared nearly 30 years ago! There are several different game modes to play through. If you're a fan of the show they need no explanation, but let us explain them to the newcomers. First up there are the letters rounds. In these, contestants need to make the longest word they can out of nine randomly chosen letters. Then there are the numbers rounds, in which players have to make a random target number using arithmetic out of six randomly selected numbers. Finally, there's the anagram round, in which contestants try to be the first to solve a nine letter anagram. Players can go up against a virtual opponent, choose practice mode or play against a friend. A lot of time and care has gone into developments, and 1000s of English words are included in the game to push your vocabulary skills to the limit.